Differing interpretations of what ‘capacity’ means. Lately, discussion has focused on ‘adaptive capacity,’ which allows local organizations to remain resilient to change. Defining long-term outcomes of CD rather than just short-term outputs. For example, what kinds of outcomes can we achieve by helping an organization build a strategic plan? Establishing causal links between particular CD activities, improvements in organizational performance, and the target development impact. Articulating a clear and logical theory of change, accompanied by realistic, need-driven targets rather than donor-driven activities and programs. Choosing appropriate evaluation tools on a case-by-case basis. Beyond a basic definition, Pact has developed a comprehensive CD framework. Pact’s framework breaks capacity down into three parts, which together form the universe of capacity development interventions. The first part of the capacity development framework describes the range of recipients for capacity development support. This includes individuals and organizations, networks and systems, and complex ecosystems of diverse actors engaged in development processes in multiple ways and with different perspectives on social change. Traditionally, capacity development efforts have focused at the individual and organizational levels. Recently, however, capacity development practitioners are increasingly recognizing the importance of working at the system and network levels in order to bring multiple competencies to work on complex challenges. The second part of the capacity development framework describes the range of methodologies for capacity development interventions. Capacity development interventions vary from expert-driven consultancy services and trainings to participant-driven peer-to-peer exchanges. The best capacity development programs employ a wide range of intervention types. The interventions are chosen based on a deep understanding of an issue’s underlying causes and tailored to the local context. Traditionally, capacity development interventions have over-relied on big ticket events such as trainings and workshops. Technical capacities related to the impact area of any given intervention. Operational capacities needed to accomplish individual tasks. Systemic capacities to ensure that key functions are performed continuously over time. Adaptive capacities to respond to changes in their operating environment. Influencing capacities enabling an entity to bring about change within its environment. Any or all of these capacities may be necessary within a given program or country context. By capacity, such as program implementation, management, or organizational structure and policies. The World Bank Institute’s Capacity Development and Results Framework (CDRF) connects capacity development results to broader development goals via the following framework: Activities → Learning outcomes → Change process driven by change agents → Local ownership, effectiveness and efficiency of resource use → Capacity for achieving a development goal. The Australian Government Overseas Aid Program (AusAID) applies Kirkpatrick’s model for evaluating training to evaluating capacity development outcomes on the following continuum: Reaction to inputs → Learning → Behaviour Change → Organizational change at the individual, entity, network and environmental levels. In “Monitoring and Evaluating Capacity Building: Is it really that difficult?,” The International NGO Training and Research Centre (INTRAC) distinguishes between the M&E of capacity and the M&E of capacity building. The former is concerned with assessing the changing capacity of an organisation (or individual, or society). The latter is concerned both with the quality and relevance of capacity building efforts, and with the immediate changes occurring. The elements of the International Development Research Center (IDRC)/Universalia’s Organizational Assessment Framework are organizational performance, organizational environment, organizational motivation, and organizational capacity. The MEASURE CD Framework for Health Sector looks at health sector-specific capacity outcome levels: system, organization, health personnel, and individual/community. Each of these levels is broken down by inputs, processes, outputs, and outcomes. The above list is not exhaustive and many more approaches to capacity development exist. Due to some of the challenges outlined in the “Definition” section above, most capacity development measurements today still rely on anecdotal evidence of change and assess effectiveness through outputs like numbers of people trained or strategic plans developed. Many international, regional, and national institutions have designed an Organizational Capacity Assessment tool to measure capacity development to address this issue. However, such tools are typically limited to short-term results of concrete activities (for example, setting up a new M&E system). The tools also rarely take into account the influence of the external environment, i.e. change in political, economic, legislative, cultural, and social spheres, on the entity whose capacity is being developed. Such assessments cannot demonstrate capacity strengthening outcomes: changes in how the organization behaves and functions, and consequently how capacity development impacts the lives of its targeted beneficiaries. In order to understand the longer-term influence of capacity development on an entity, practitioners need to be able to see whether the entity has improved its performance over time. Pact’s theory of change (see graphic) connects organizational change at the output level (change in the systems, skills, and policies of entities) to changes at the impact level (influence at the community level) through measuring growth in organizational performance. Pact has developed the Organizational Performance Index (OPI) to measure this growth in each individual partner entity, and to analyze trends by country, region, and around the world. 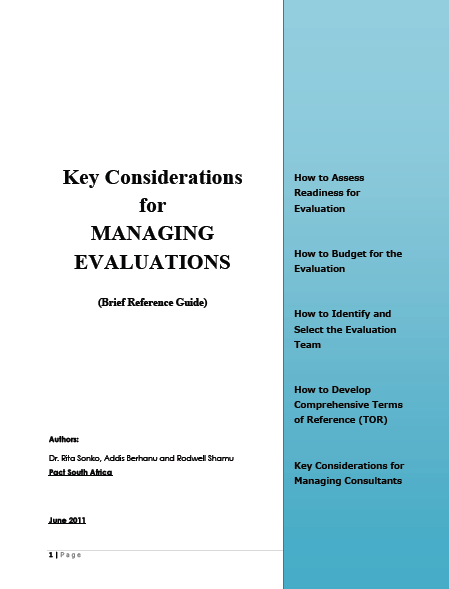 A good capacity development evaluation literature review can be found in the materials of the European Commission’s Directorate General for Development and Cooperation. There are a number of other organizations exploring new approaches to measuring and analyzing the outcomes of capacity development interventions: Root Change with its STAR approach, Global Giving and the Storytelling project, TCC Group and the Advocacy Capacity Assessment Tool, Foundation Strategy Group's (FSG) Shared Measurement system, Deloitte’s Maturity Model Assessment Tool, and the popular Outcome Mapping methodology. It would be great to get some references to the resources mentioned here.